Christine Jackson is a senior middle hitter on Shepherd University’s women’s volleyball team. 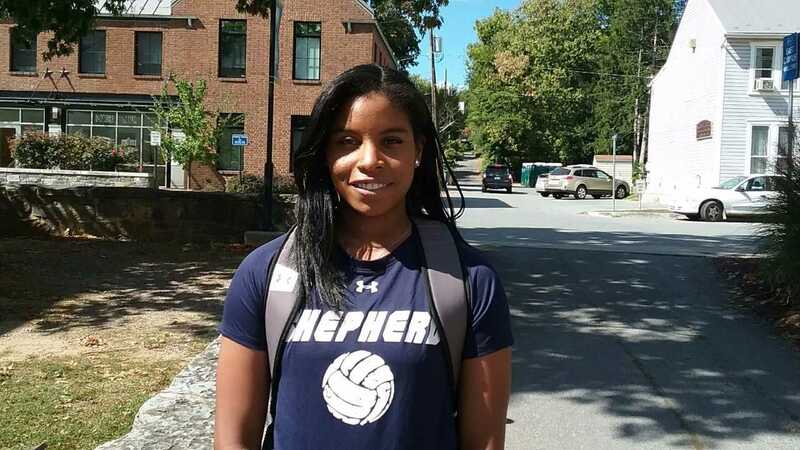 Jackson sat down with The Picket to talk about what it is like playing college volleyball, in addition to what originally brought her to Shepherd University. Jackson, a Graphic Design major, is from Stafford, Va. She was brought to Shepherd by the community atmosphere at Shepherd. With everyone being friendly, this also helped her decision to come to Shepherd University. The school’s art program also largely factored into Jackson’s decision to come to Shepherd University. Originally, Christine played soccer and basketball throughout her childhood, and not volleyball. It was not until high school that Jackson discovered her passion for volleyball and started playing the sport. She earned four letters in basketball, three in volleyball, and two in soccer while she was in high school. Jackson believes that college volleyball is much faster than high school volleyball was for her. There are also larger amounts of school work and a smaller amount of time for leisure activities, which necessitates having the ability to plan out her daily and weekly schedules to balance it all. When Jackson steps out onto the court for every volleyball match she plays, she goes out there with a focused mentality because she does not want to have regrets when the game is over, knowing she could have done more. A regret that Jackson has about her time at Shepherd University is that she did not ride the Pantran as often as she wishes she did. During the course of the season, she naturally gets tired from all of the workouts and doing homework, so not taking the Pan Tran as often as she did is a personal regret she has. Information concerning where Jackson lettered in high school sports came courtesy of Shepherd University’s Athletics Department. Previous articleThe Shepherd Rams’ football team (3-0, 3-0 MEC) will travel to Athens, W.Va., to take on the Mountain Lions (1-3, 1-3 MEC) at 12 p.m. Saturday. So far this season, the Rams are averaging 50.6 points per game, and sit in first place in the Mountain East Conference standings with Fairmont State (3-1, 3-0 MEC). Players pictured from left to right Evan Ostrow, Jamie Colon, Levi Lloyd, Eric Ostrow, and Keandre Baston.